Before getting a new puppy, you’ll need a new puppy checklist of things to buy for a new puppy, and you will need to have them before you bring him home. So you need to get organized, gather your new puppy supplies, puppy proof your home and decide what your house rules will be. It’s important to do this BEFORE your new pup arrives, so that the transition will be smooth. You won’t want to run to the store at the last minute for puppy supplies that you forgot to get. Preparing for your new puppy will help her make a comfortable transition to your home. 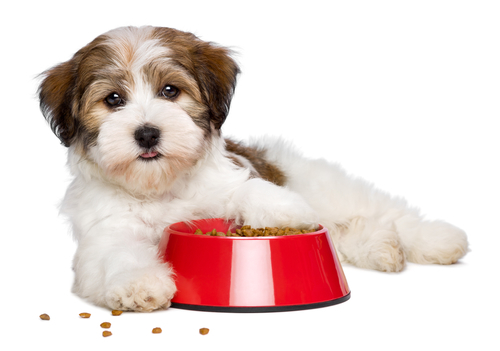 Puppy Food – Find out what food your puppy has been eating at the breeder’s or the rescue shelter, and buy a bag of the same kind of food. You can switch his food later to another brand or type of high quality puppy kibble, but you should start him on the dog food that he’s been eating. Switching foods should be done gradually, not all at once. 2 Puppy Bowls – You’ll need a bowl for food and a bowl for water. They don’t have to be fancy, but they should belong just to your puppy. Make sure that your dog’s bowls are not tippy. While you’re at it, consider buying a mat to go under your dog’s bowls. Dogs can get pretty sloppy when eating and drinking, and a mat will help keep your flooring nice. Safe Puppy Chew Toys – You only need to have one or two toys for your new puppy. Make sure that you have something that he is allowed to chew on—and that is safe for him. Puppy Collar and Leash – Purchase a soft nylon or cotton collar. You’ll need to work on getting your puppy used to wearing a collar right away. Puppies can wander away, and you definitely don’t want to lose her! Make sure you get the right size. You’ll have to measure her neck to do this. In addition, you should have a leash, so that you can keep your new puppy safe when outdoors with you. I like a harness for taking walks, as this stops the pulling that most puppies are prone to do. Crate for Small Dogs – Your new puppy needs a place to sleep and a place to feel safe. Make sure your puppy has a nice safe place to sleep because your first night together can be long and frustrating. His new crate doesn’t have to be fancy, but you need to have this before your puppy arrives. Trying to do without it, will result in accidents on your carpet and floor—and a lot of frustration! 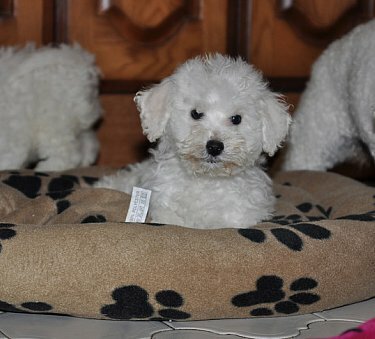 Dog Brush and Comb – Bichon Frise puppies need to be groomed daily, even though they are still puppies. At the least, you’ll need a brush and comb. A de-matting tool is helpful, as well. Washable Dog Blanket – This will help your puppy feel comfortable and loved. As she gets older, she will still love to snuggle on her warm, soft blankie! Cardboard Box Lined with Newspaper – you can use this to transport your puppy home in the car. It’s the safest way to have him travel, and he should be comfortable in the box, as well. Puppy Treats – You will want to have some little treats on hand so that when you begin to work with your puppy, you can reward her. Bringing home a new puppy is not a major undertaking. But it is important that you get organized and get your puppy supplies before you actually go to get your new puppy. Doing so, will help you be ready, and your puppy’s acclimation to his new home will be sooo much easier if you are prepared! One of the best things that you can do to be prepared is to familiarize yourself with Doggie Dan and his fool-safe puppy and dog training methods. Dan will show you how to work with even the most stubborn or aggressive dogs. And his methods are gentle and proven. Dan even has videos that will help you prepare and be ready for your new puppy or dog. You can view over 100 training videos for 3 days for just $1.